Stone circle or tipi ring sites are found on the western grasslands and in bordering mountain ranges from Canada to Mexico. Tipis or tipi-like structures were used by Plains Indians for 5,000 years or more, and perhaps no other site offers a better symbol of the nomadic way of life. Almost all of the rings of rocks we see today mark the exact location where a conical, bison hide tent once stood. Rocks were placed around the base of tipis during windy conditions or when the ground was too frozen for wooden stakes. Archaeologists have used known sites to estimate the number of tipi rings on the Plains. Several decades ago it was estimated that there could be 650,000 rings in southern Alberta alone. 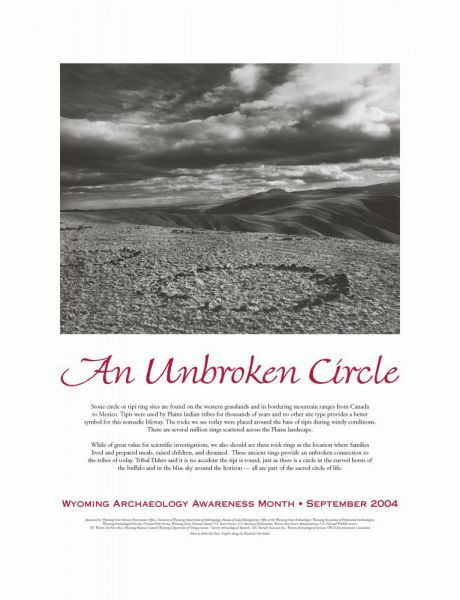 Nearly 3,000 tipi ring sites are documented in the records of the Wyoming State Historic Preservation Office, and a similar number have been found in Montana. There are probably hundreds of thousands more yet to be found. Stone circle sites can range from an isolated circle up to large concentrations with several hundred rings. While early historic tribes were known to have camped in large groups, most of these larger sites appear to represent accumulations over a period of years. As with all hunter-gatherer cultures, segments of a tribe would gather and disperse over the course of a year as dictated by economic, social, and ceremonial cycles. Tipi ring sites can be found everywhere from river flood plains to above timberline, but they tend to be most concentrated where there was the best hunting access to bison grazing areas. Access to diverse edible plants, firewood, and other resources also was important. Other ring clusters are associated with trails leading up through mountain passes. In settings such as the lower foothill grasslands at the base of a mountain front, or up on the high ridges bordering river valleys, stone circles can be found scattered mile after mile, for 50 miles or more. There is always a good reason for where tipi rings are located. Some arenestled I in sheltered areas, with high artifact densities indicating longer or more frequent occupations. Most rings are found on open, windswept benches that do not seem Eke good camping places. Upon closer inspection, however, these exposed settings turn out to be well away from insect-infested river bottoms in the summer or areas of drifting snow in the winter. Tipis varied from 10 feet in diameter up to 30 feet or more. Although rather cumbersome, with 15 or more long poles and a thick hide cover, the tipi was carefully designed for life on the Plains. The conical shape sheds the wind and the smoke flaps at the top of the tipi can be adjusted to establish the best chimney effect. Flaps can be closed to keep out rain, and in the winter a liner can be draped down inside the tipi to provide better insulating aualities so that one small fire can keep the occupants quite comfortable. During hot weather, the bottom can be raised for air circulation and the high smoke flaps can be set to capture the slightest breeze, scooping it down into the tent. Some groups started by setting up a 3-pole tripod while others utilized a 4-pole framework. The following poles had to be placed in a careful and exad sequence, with each pole size-graded so that their tops had a pleasing, fan-like symmetry. Early explorers and travelers were so impressed with the technology of the Plains Indian nomads that the historic literature is filled with a wealth of relevant comments. Map of known stone circles recorded in Wyoming. Although the rocks in a circle often have been somewhat scattered, each ring reflects the architecture of the tipi that once sat there: The pattern of these circles and their associated artifacts can inform us about ethnic identity, family size, seasonality, and other factors. Tribal camps were known to have a definite social arrangement and the kinship structure of the different bands survives today in these scattered rings, waiting to be discovered. Archaeologists have studied tipi rings for more than 50 years, and we still are learning about the old ways.